Who are My mother and my brethren? LIVE – LIFE MORE ABUNDANTLY – EVERY FRIDAY AT 07:15 p.m.
19 Then came to him his mother and his brethren, and could not come at him for the press. 20 And it was told him by certain which said, Thy mother and thy brethren stand without, desiring to see thee. 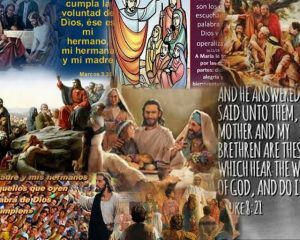 21 And he answered and said unto them, My mother and my brethren are these which hear the word of God, and do it.